Tangier Sound Lighthouse – Chesapeake Chapter U.S.L.H.S. Tangier Sound Lighthouse was built in 1890 in the Chesapeake Bay just southeast of Tangier Island. It was a square screwpile lighthouse. The lighthouse suffered damage in a 1905 ice flow that drove a schooner into the structure. 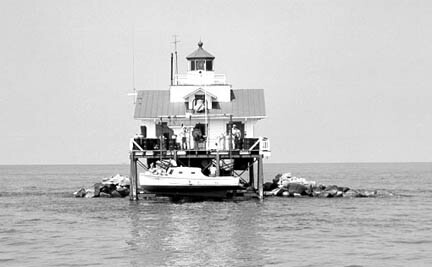 The lighthouse was automated prior to being dismantled in 1961. The current steel tower was erected on the original foundation.